When love is in the vogue, then why your body be deprived? If you ask the means, love tatts are the answer. Love tattoos have become a wide genre these days. Love tattoos show love for the ones you love, in a creative way that they get more close to you. 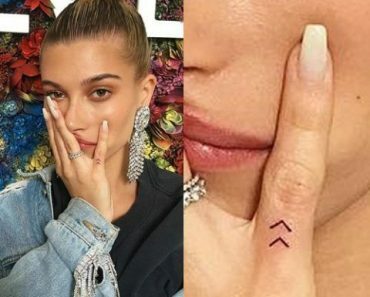 There are multiple designs among love tattoos, right from the roses to hearts, cupid with his bow and arrow, inks of the names of your loved ones, locked lips and a lot more. Love tattoos can basically include any symbol or element related to love according to the choice of the wearer and the skills of the artist. Love Tattoos paint various feelings like trust, passion, belief, hope, friendship, devotion, and aspirations. One can express his or her love may be for a friend, life partner, or mom and dad and even God. But what here lies important is that before getting a tattoo inked on your body, one should know its relevance completely. Let us not dash for a tattoo without knowing what it stands for. 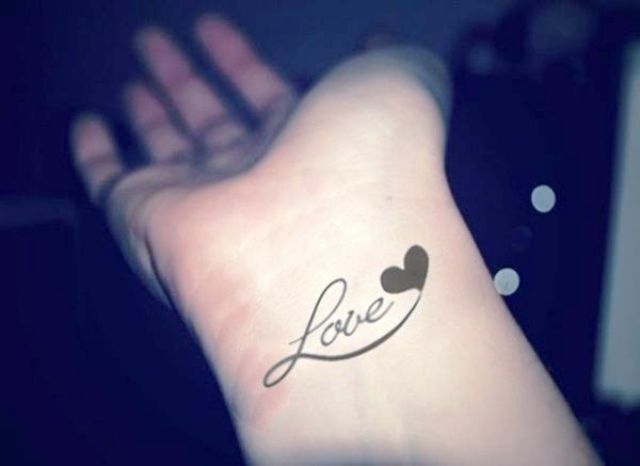 Here you can find amazingly popular love tattoos with their meanings. When one’s mind thinks about love, the very first image which gets conceived is nothing but heart. 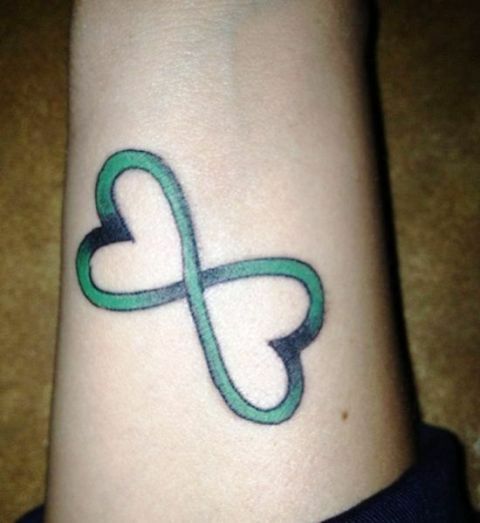 The tattoo in the above picture shows an infinite heart, representing everlasting, endless love. An eternal heart can visualize your love in the most appropriate manner to your loved ones. The perfect thing about a heart ink is that it can not only extend your love to your life partner but to God also for that matter, by accommodating a cross or angel or wings to the eternal heart which represents Godly faith and love. But in general terms, one can get this tattoo done for any loved one in life. Almost all flowers are commonplace for love and compassion since ages. But specifically, a rose is one of the most romantic flower even known to this world. The rose can be blended along with a name of your loved one either inside or in an indented sort of a line circumscribing the flower. This beautiful bird symbolizes love. One can turn this tattoo more adorable by adding a banderole to the neck of this dove or by engraving a name of the loved one on such banderole. 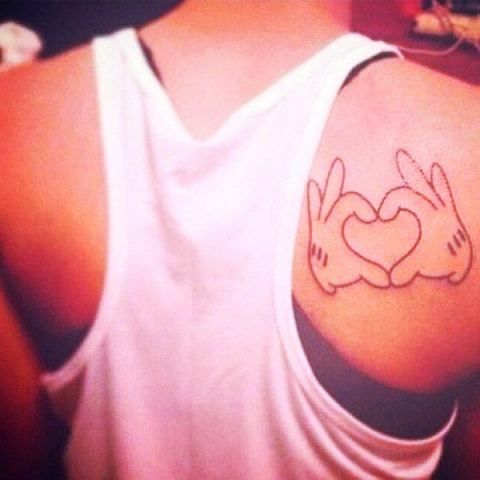 The tattoo in the above picture can be one different way to ink letters of “Love” on your body. It can be in multiple sizes and fonts to make it more glorious. One can add few stars, sparkles, and flowers to this design. 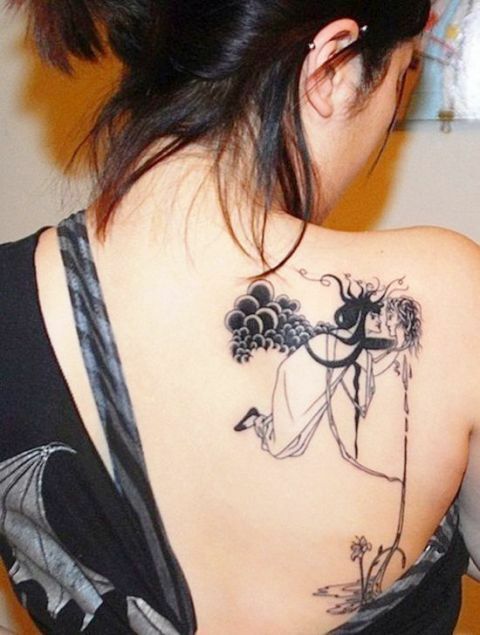 The best part is one can get this tattoo done on any part of the body. The famous verse saying, “You owe the key to my heart,” can be portrayed through this Key and Heart Lock design. This design can be given different artistic twists and twirls like a key with a heart or a lock made out of the heart with a wide parade of vibrant colors. One can also add-on a plug by having a key on your body and lock on your beloved ones, or vice-versa. Cupid is a well-known symbol of love that includes a magic bow and arrow. It is believed that whoever he decides to shoot with the arrow will fall in love. A cupid can come around with a heart or a dove. This can be a great way to show your love in the most elegant way. Nothing can match up the power of music in expressing one’s feeling of love. Like goodie-goodie love, music also sets the soul free. One can beautifully match up with musical notes or a butterfly and shape of a heart. It can be taken as different love languages spreading through music. Lilies are well-heeled love symbols among different cultures of the world. It can be summed up with hearts, stars, butterflies and musical notes and still will be best associated with love. As per Christian and Jewish beliefs, angels are guardians sent from heaven to protect us at the time of ups and downs. This is a sign of God’s love. 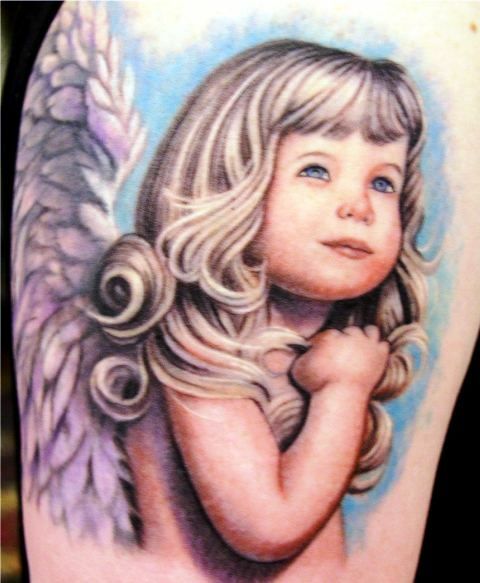 Such tattoos can be in the form of adult female or a child Angel. One of the best ways of commemorating a blossoming relationship is to get this couple tattoo, with names or feelings of each other partially split. This bird’s wing love tattoo is customized for girls more often. Bird’s wings symbolize peace and love towards others. It looks very decent and fashionable for girls who can carry beautiful neck designed uppers. 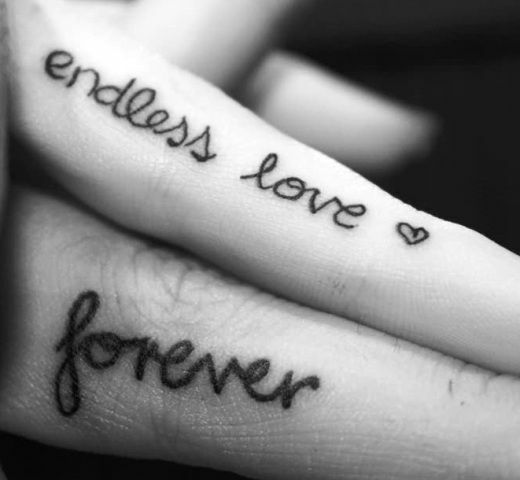 Such is an attractive tattoo design signifies everlasting love. This is a partially spread tattoo among two fingers, giving it a unique look. 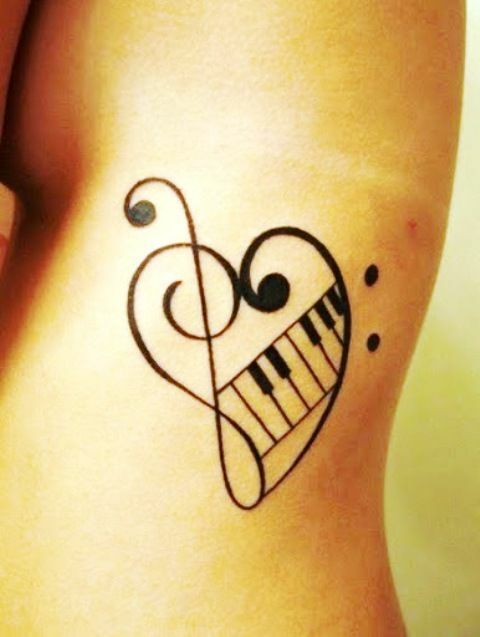 This heartbeat tattoo is one of the brilliant inks seen usually on women arms. This philosophical piece gives another level to the traditional portrayal of a heart. 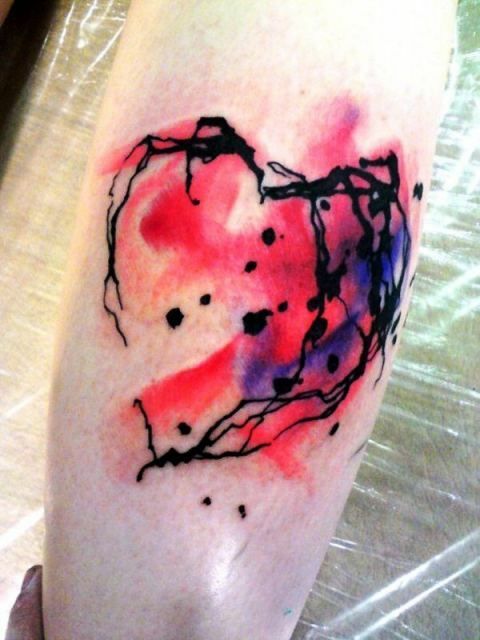 Inkblots are used to create the outline of the heart while smudging of vivid pinks and purple hues the tattoo. 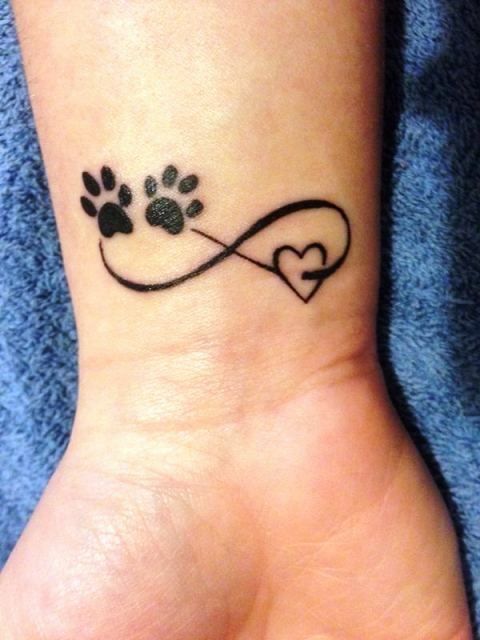 This is an animal lover thing, if the wearer wants to express his or her love for dogs, can be done by inking infinity sign through a heart and pair of dog paws. A full multi-colored tattoo resembles a sword breaking through a winged heart on the wearer’s chest. Countless black heart outlines in the above picture overlap one another to create a hypnagogic tattoo on the wearer’s bicep in this tattoo. 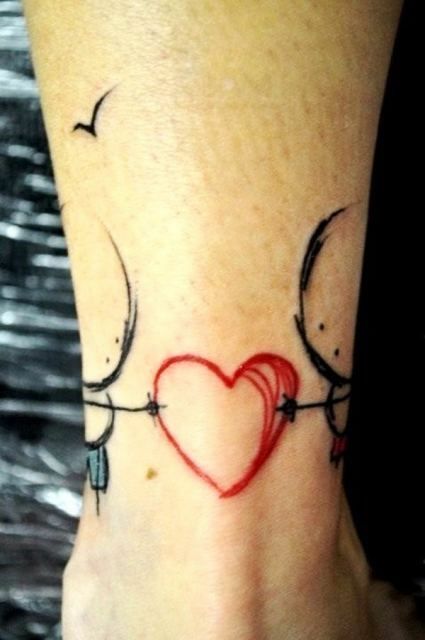 A roughly drawn set of people hold a crudely drawn heart between them and the childlike piece is inked on the back of the wearer’s right ankle. A heart formed lock is added bells and whistles with ornate designs which hold significance from Victorian antiques. The lock displays a hole for a skeleton key and is overlapped over a strip of cheetah print. The piece is depicted in a chastened color palette of black, red, and gold. 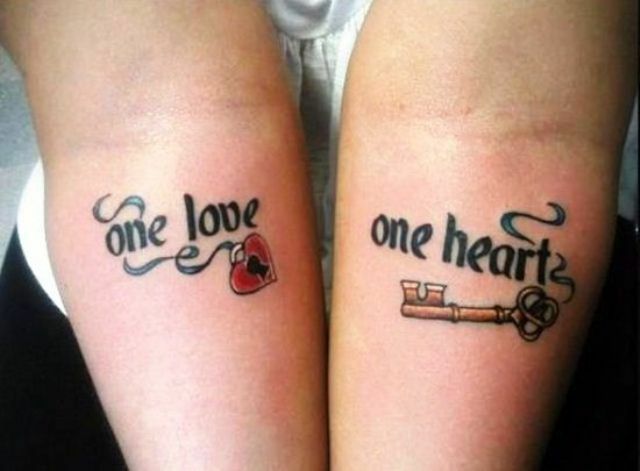 The above picture and tattoo draw allegiance from the classic video game franchise “The Legend of Zelda.” The four hearts pictured on the female’s bicep depict the life bar seen in the game while the male has the sprite for the main character “Link” tattooed on his bicep. Defensibly the most well-known pair of mouse gloves in the world form the shape of a heart with the fingers on the wearer’s right shoulder blade. 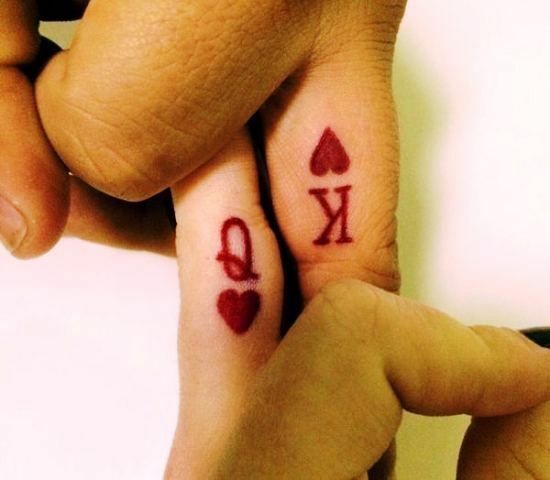 This couple has a king and queen of heart symbols inked on their middle fingers using a traditional classic red color in this tattoo set. The tattoo in the above picture represents a well-done heart. It may be seen as an achievement in love life or any other relationship for that matter or maybe an inspiration for self. Such quote tattoos are famous too, may depict self-love or even good to go for others regarding.